Ah, the Mazda Miata. A sportscar that has been around for more than 20 years has garnered its fair share of opinions. Best convertible on earth and small for size and big on handling; to a girly mobile that a man would never drive. I had a chance to drive one for a week, and to any of you that say it is solely for the female gender, you are missing out. Yes, I am a said female, but this compact courier has a lot of amenities and drive qualifications to make most cars in its class blush. This is no regular Miata, though. This is the Special Edition, which has the Crystal White Pearl paint job—a color that was beautiful both in the sun and shade. 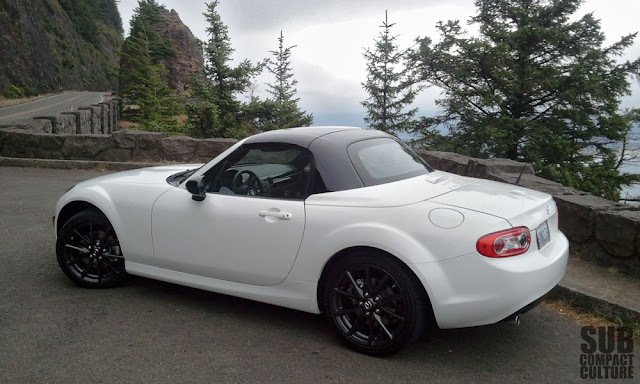 It is also a hue unique to the Special Edition MX-5, as is the black power retracting hard top (PRHT), black side mirrors, and dark 17” alloy wheels wrapped in high-performance 205/45R17 tires. Xenon headlights, an aluminum hood, and silver dual exhaust outlets round out the exterior. We had had gray skies and fog every day I had the car, so the top was up much of the time. However, top up or down the car is a lot of fun. I now know why one drives around with the top down in 50 degree weather with the heat on! Weather your cruise permits you to have the top down, or inclement weather forces you to have it up, I think the styling of the vehicle looks fashionable and classy in either respect. Always seeming to be a complaint, the interior quarters are on the tiny size. I am a vertically challenged 5'-3 1/2” tall woman, who after a day's drive to the Oregon coast and back (about 240 miles round trip) had a hard time getting out of the car and felt cramped up. If you can overcome the interior's smallish cabin feel, the interior is well-appointed in many respects. Mazda's use of matte vs. high-gloss materials, easy-to-read full instrumentation clusters, usable trunk space, Bose seven-speaker stereo system, and one-button push-to-retract hardtop are a delight. The heated leather trimmed seats are adequate and firm, but I wish there was a bit more lower back support. The center console houses the power window controls, stick shift for the six-speed manual transmission, the emergency brake, and a cubby for snacks and your phone. Although a well-thought out console, I wish the stick shift was a bit lower in overall placement. I found myself wishing for a lower shifter in spirited driving. The days of remembering my very first car, a 1987 Honda Civic CR-X, its shifter was lower, with its surroundings more open. Minor detail. This Mazda Miata was so much fun to drive I hated to give it up at the end of the week. It is spirited, corners like it’s on rails, never seems underpowered (even when passing going uphill), and makes driving fun. It begs to be tossed around, and rewards you with a pleasurable driving experience, whether on curvy roads, city streets, or on the interstate. The six-speed transmission coupled to the 2.0-liter DOHC 16-valve VVT engine purrs along, and comes to life—especially when you hear it with the top down. 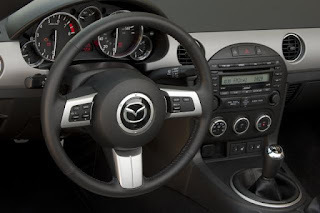 The Mazda Miata MX-5 was one of the most fun and entertaining vehicles I had driven in a long time. Its responsiveness, classy looks, and most importantly—price—wins me over. Base model Miatas can be had for $23,720, while my test model's MSRP came in at $31,225. That is pretty impressive seeing as other convertible sports cars fetch a lot more of your dollars if you buy one. Also consider Mazda only brought over 450 of the special edition models, which are also available in red. We did a quick look on AutoTrader.com and found a few still up for grabs across the U.S. 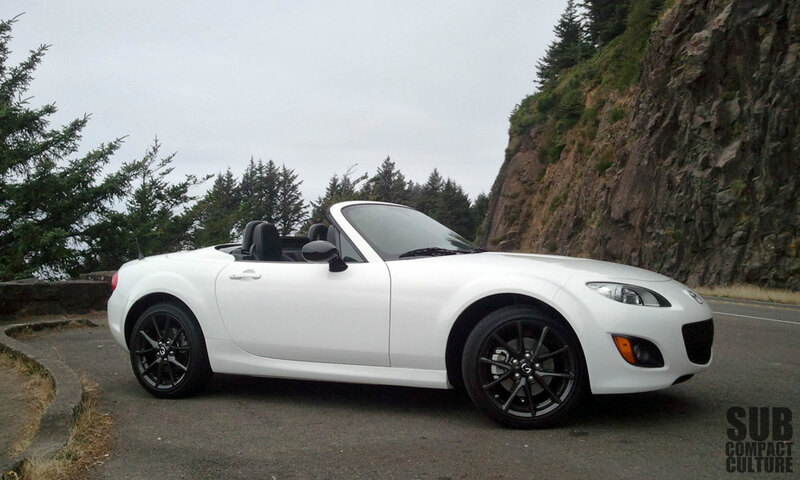 The Miata—top up, fun. Top down, totally fun and worth the price. A shame we don't have that car still sitting in our driveway!